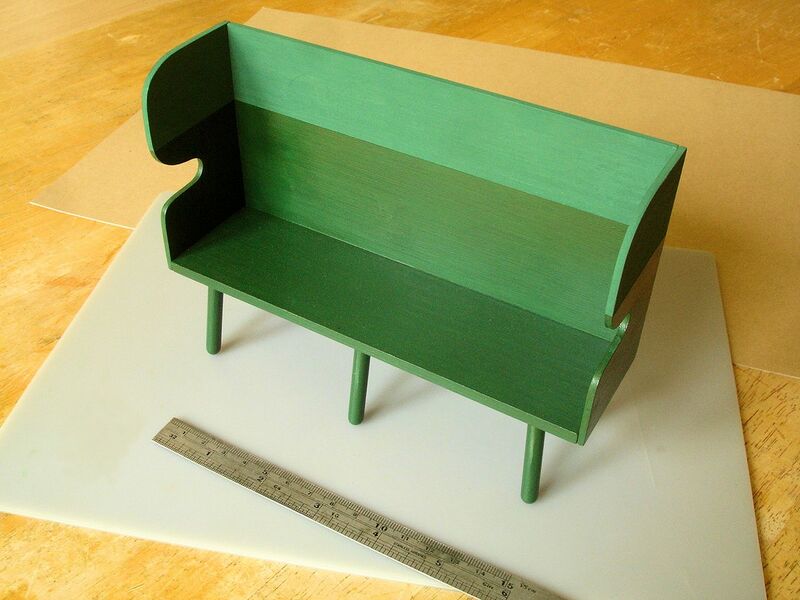 I was recently asked by The New Craftsmen gallery in London to make a series of 1:10 scale models of a new furniture collection they were producing, conceived by the stylist Sue Skeen. The accurate models were meant to serve as a ‘portable collection’ to help show the range to customers and as publicity objects before the actual pieces were ready. The models were used in a photoshoot for World of Interiors magazine and were to be presented during the London Design Festival. 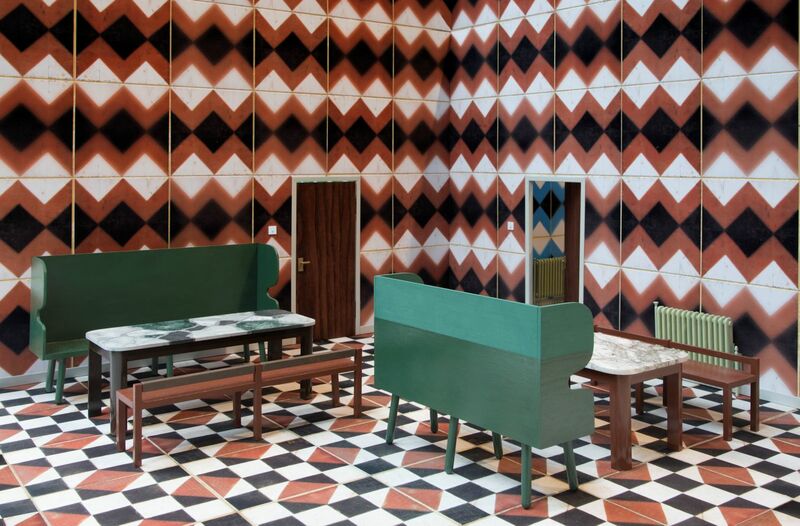 The image above is one from the photoshoot, for which I was asked to make a large model ‘set’ consisting of three distinct rooms with very bold, oversized decoration but including some realistic accessories such as doors, light switches and ‘retro’ radiators. 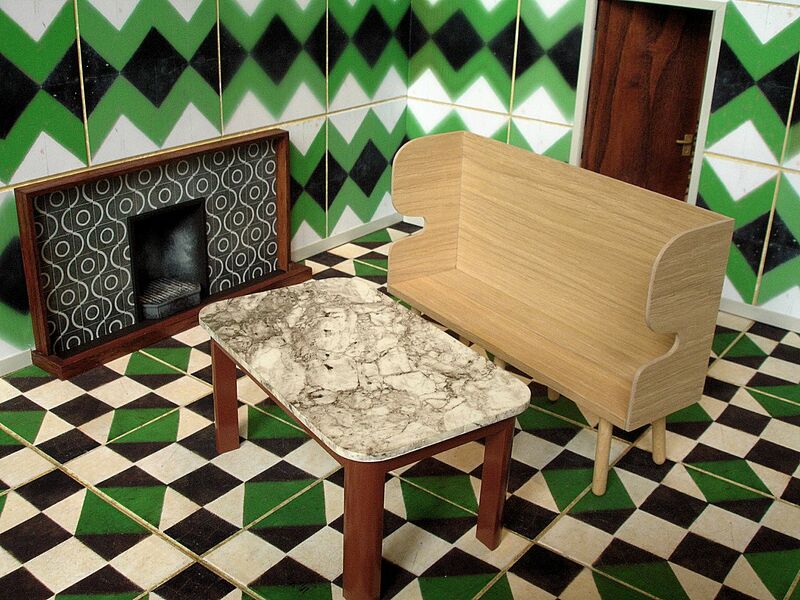 These included the re-creation of a vintage fireplace as direct homage to the artist/designer Peggy Arnold whose work was one of the inspirations for the collection. What had to be sorted out first was a reasonable scale in which to show the pieces to best advantage while still keeping them easily portable. At first 1:6 scale seemed reasonable, the size that Vitra use for their chair model collection .. but although that might work well for chairs, some of the new furniture pieces were over 2 metres long .. too bulky at 1:6 to carry many of them around, so we had to go for 1:10 scale. One of the next most interesting challenges was deciding how the range of different surfaces would be represented, particularly in terms of the scale. With surfaces it’s acceptable to play with scale up to a point .. in fact many surfaces wouldn’t ‘read’ well enough at a small scale so they need some exaggeration. A natural way of doing that for wooden subjects is just to use the actual wood. 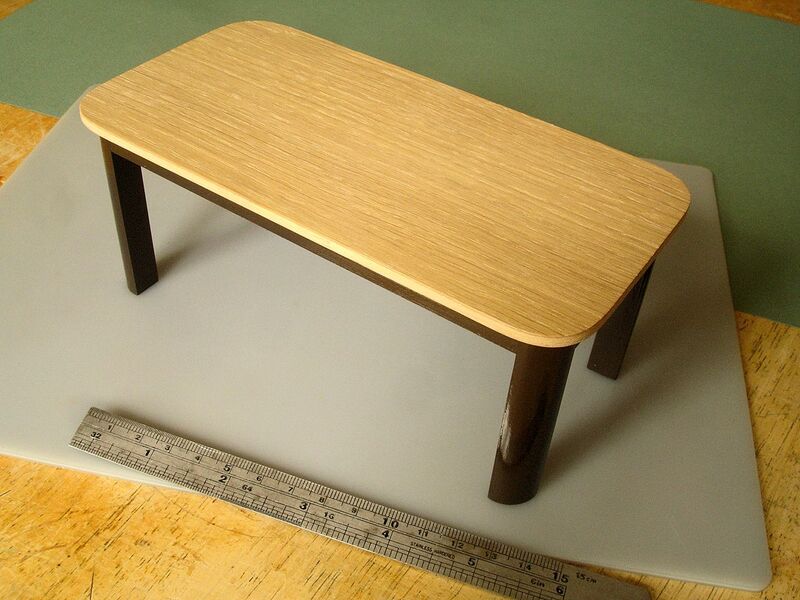 For example the table above has an oak top so I’ve used good quality oak veneer laminated onto a Pvc base. Oak veneer is too brittle for wrapping round the curved edge so here I used ash veneer instead. 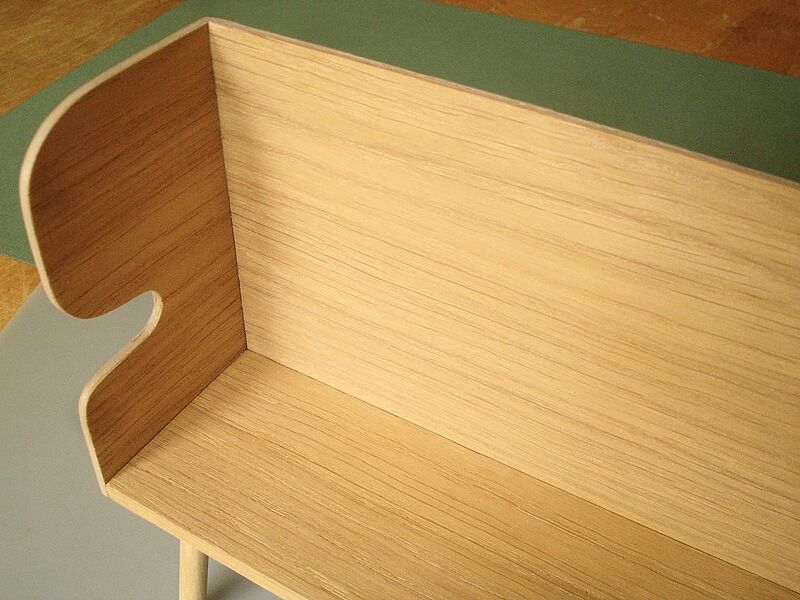 For this collection I had to do quite a lot of careful veneering to give the effect of solid tops or legs, because woods such as oak, ash, sycamore or Douglas fir are not available in ‘model friendly’ thicknesses apart from veneer. 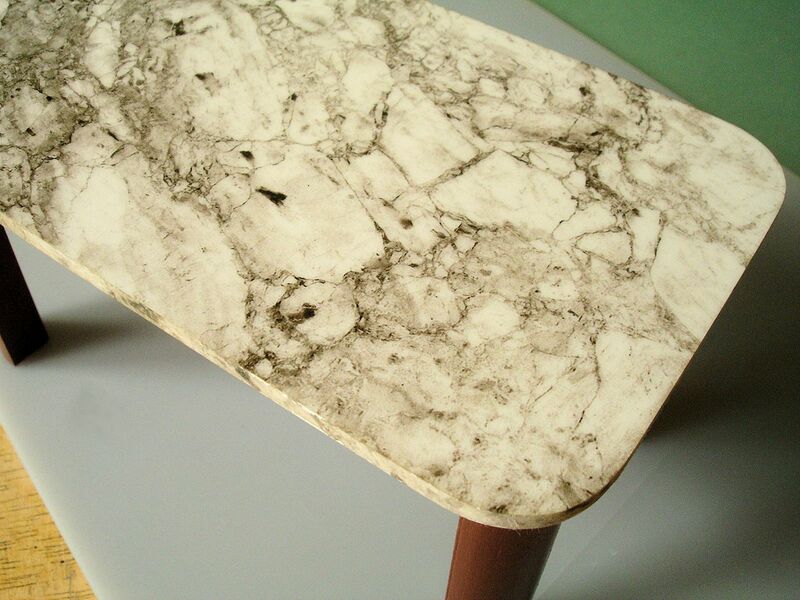 Likewise, the specific Formica pattern intended for these tables would have appeared too nondescript at a dutiful 1:10. On the other hand though, using the actual Formica wasn’t an option either .. impossible to work with, and in any case too bold at 1:1 .. so in the end I made my own graphic version of the pattern and printed it at a size I felt was right. I sealed this within acetate ( see later for technique ) which I rubbed with fine abrasive cloth to give the right ‘satin’ surface. Representing a rushwork seat turned out to be simpler than I’d thought. I found that I could get quite a good suggestion by embossing/carving into 5mm foamed Pvc .. the material I turn to for solving just about everything! Once patterned I undercoated in a dark, warm grey acrylic and dry-brushed the lighter rush colours over. For both the marble and the terrazzo tables below I was able to utilize methods I’d tried for the first time in an earlier job this year for The New Craftsmen and Christies. The marble effect here is a photo image printed on inkjet transparency film (also known as OHP film or ‘printable acetate’). 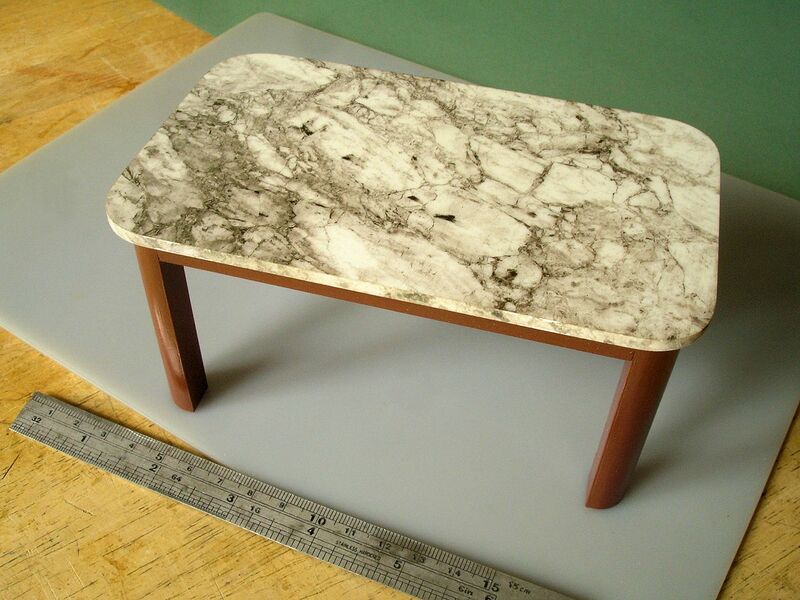 The marble intended for the real table was a specific type called ‘Bianca Eclipsia’ and the supplier’s website had a number of usable images, and in this case it made sense to adjust one to the right 1:10 scale. The makers of transparency film recommend waiting 10mins for the ink to dry but in practice I’ve found that it takes much longer, like a few hours, before the ink is properly smudge-secure. The marble top was to be 30mm thick in reality so I’d cut and shaped a piece of 3mm Palfoam (foamed PVC). After the image had dryed I lightly spraymounted it on the inked side (using the stronger 3M DisplayMount), pasted it firmly on the Palfoam, and carefully trimmed round the edge. It’s difficult to trim the acetate exactly around curves, even with a new scalpel blade, so I usually cut as close as I can and finish off by sanding with P120 sandpaper or finer. Sanding has to be done just in the downward direction (i.e. downward from the top surface) otherwise the acetate film will lift at the edges. With the acetate attached ‘smooth side’ up the image is now perfectly sealed within. That’s all fine now, if you want a glossy, highly polished surface, but most marble has a more tastefully subdued one .. as if frosted. 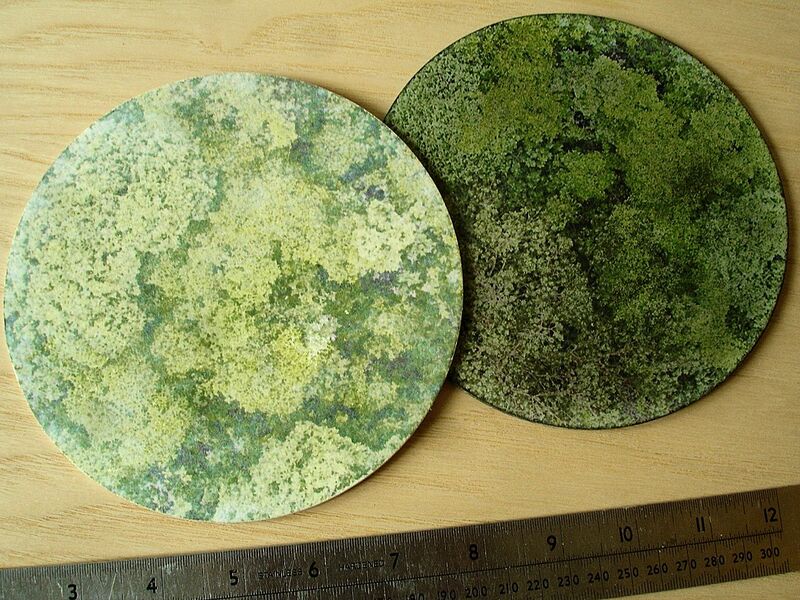 This can be achieved by sanding the acetate either with fine ‘wet and dry’ paper’, decorators’ sanding pad or something else finely abrasive like the rough layer on a kitchen sponge. Now it feels even more that the marble pattern is coming from within the surface .. rather than lying dead on top like paintwork! If evenly sprayed the acetate will remain secure on the surface, especially if there are no protruding edges left to catch. If in doubt, both the image and the base can be lightly sprayed at the same time for extra adhesion. I realized though that this method wouldn’t work for surfacing the edge .. a 3mm strip of acetate would never hold! I’d done some experiments before where I’d printed images on regular matte coated inkjet paper, sticking them ink side down on PVC, and washing/rubbing the paper part away. I found that the image was left almost completely on the PVC .. preserved in the chalky coating which had remained firmly stuck to it. So I filled in the marble pattern around the edge of the top that way .. printing more of the same on matte coated paper; cutting thin strips of it; pasting those ink side down along the edge; trimming the excess; soaking/rubbing off the paper. Above is one of the first tests I made of this method, comparing the effect (using a photo of treetops) of transferring onto white and black. What remains of the image after all the paper has been removed is semi-transparent .. but I was surprised at how much of the detail and colour still came out against black. Especially if a strong glue is used e.g. 3M DisplayMount or PhotoMount, the image is very secure .. hardly possible to scratch it off even! Going back to the inkjet transparency film for a moment .. I had used the one sold at Ryman’s, A4 size and 100microns thick (which I think they all are). Ryman’s seems to be changing their products now, so I’ve put a link here to the same material from PhotoPaperDirect. Wherever they’re from these sheets cost between 50p – £1 each. 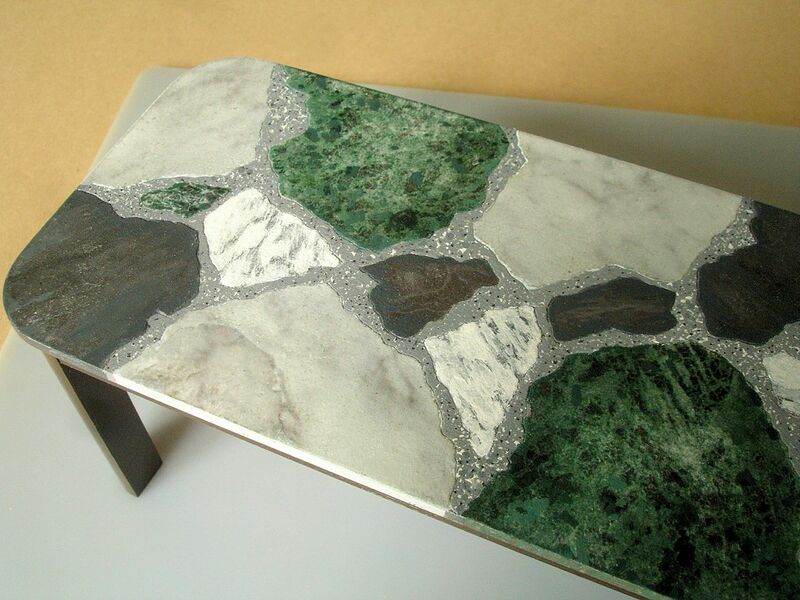 I went into such detail describing the ‘print transfer’ method I used on the marble table edge .. because I then used it to create this ‘terrazzo’ table model below. Like all the table-tops here and many of the other elements, the basic form was made out of Palfoam ( or Palight if it needed to be a bit tougher). 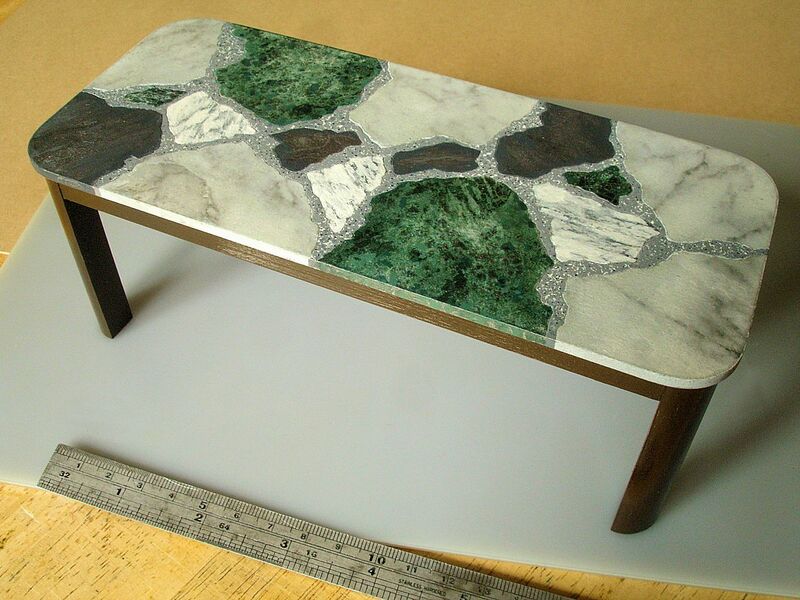 The ‘look’ of the table-top and the choice of marbles and granites were fairly well defined by the client, though an actual table was yet to be made at that time. I colour-printed a range of images; chose the best areas and drew the shapes on the unprinted side; pasted each piece in place printed side down; soaked and rubbed off the paper. It’s important to remember that this is likely to work best on a white base and I should note that sometimes definition and colour may be a little subdued because we’re seeing the backside of the ink, as it were, soaked into a minutely thin chalky layer. After the surface was cleaned up and dried I emphasized the edges of each shape with a slight, embossed line. In the real table these would probably be completely flush, so this is another of those little ‘enhancements’ to realism, and to clarify that it’s more than just a printout. The best sources I found for a wide range of wood veneers were Vale Veneers woodveneeruk.co.uk and Wood Veneer Hub thewoodveneerhub.co.uk. Vale Veneers had the smaller range but a handful of common woods in particularly ‘flexible’ paper-backed form, c. 0.6mm thick. This was the type I was hoping for because it generally lies flatter and can be stuck down evenly without using a lot of pressure. I had imagined paper-backed veneer might be pricey but the cost from Vale Veneers was generally about £3.50 per sq foot. Originally the remit from The New Craftsmen included pieces in the less common sycamore and Douglas fir but these were available from The Wood Veneer Hub for a similar price though not paper-backed. I made the basis (that is, the underlying material of each piece) of this oak ‘settle’ from Palight foamed Pvc. 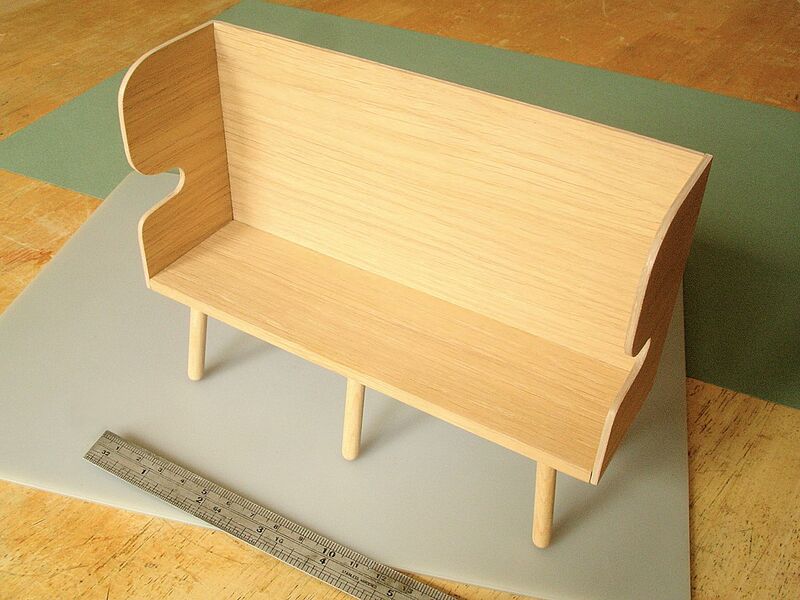 Each piece would then be clad on both sides with 0.6mm oak veneer. The visible edges would also have to be clad and this slight dimensional difference had to be foreseen and compensated for when cutting out the Palight pieces .. there’s a lot of searching, logical thought going into this but that’s what I most enjoy, even though I might not be the best at it sometimes! Oak is not very pliable even in veneer form so for covering the curving edges I had to use ash veneer .. the difference in tone should not be so noticeable at this size and if it is it can always be tinted to match. 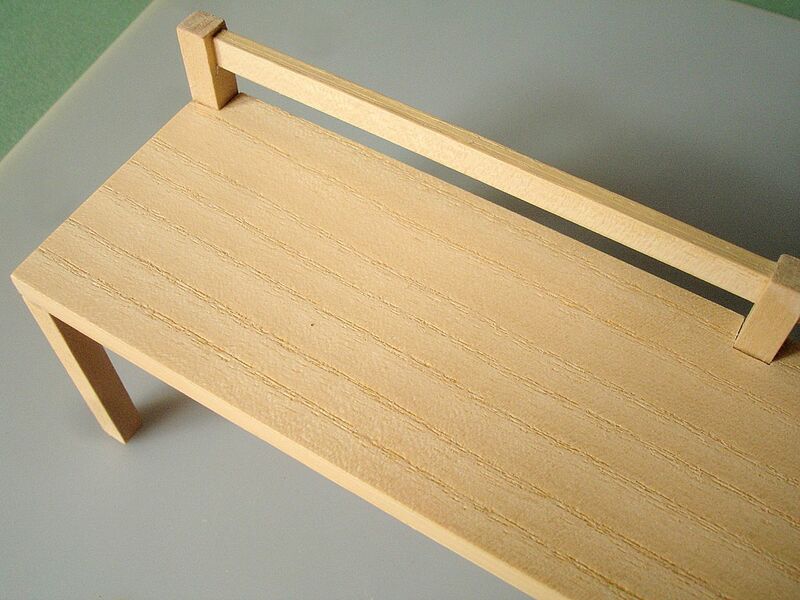 The same applied to the birch dowel used for the legs. The correct order for cladding is .. edges first, and then faces because they’re more visible. It means that any join-lines will be on the edges where they blend in better with the other edge lines. In the event of visible gaps these are much easier to fill and disguise if they occur on the edges. For the edges I cut long strips wider than needed and, surprisingly, in the direction of the grain .. normally this direction is the least flexible but I found that ash veneer could do it and when I’ve tried thin strips against the grain they just didn’t look right. After I’d pulled, glued and pressed the edge strips in place I needed to trim them near with the scalpel and finish off with a sanding plate (i.e. a thin piece of wood or plastic with P120 sandpaper attached). I did the same with the face cladding later. I used superglue throughout. Both on the edges (applying to the plastic, moving along bit by bit) and on the faces (applying a rapid network of thin-ish lines to the plastic, especially the outline, and pressing all at once). All the tables were designed with ‘quadrant’ profile legs .. two sides of a square on the inside and a 1/4 circle curve on the outside. This was a very pleasing shape with also a lot of variety to it when seen from different angles. 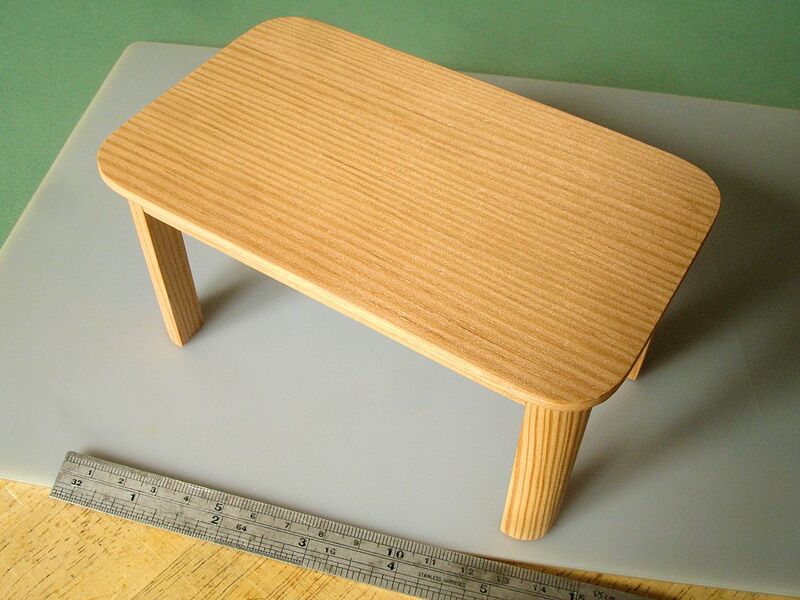 Most of the tables had painted legs and frame, so I shaped a prototype leg, made a few moulds and cast them in resin. However, the table below was to be solid Douglas fir, top and legs, so I had to mould and cast a thinner versions and veneer them .. hoping that I could get the veneer to stay with the curve. As it happens this worked fine mainly thanks to the effectiveness and speed of thin superglue in sticking wood veneer to PU resin, especially since the Oregon pine (the only available version of Douglas fir) fought a bit against bending. Much as one might like to in order to preserve its naturalness, there’s no way that a wooden model can be left untreated if it’s going to be handled. It absorbs natural grease and dirt from the fingers, this is turn attracts and fixes dust, and in no time the wood appears grubby. But the wrong choice of treatment can be just as demoralising! I wanted a coating that would hardly change the appearance of the untreated wood, certainly not make it visibly darker. Also, I couldn’t afford that the treatment would have any permanent warping effect on the veneer as some of the elements were quite thin .. and this can often happen when a water-based medium is used. I did a number of tests with different clear ‘varnishes’ including oil; spirit-based matte and water-based matte. In the end there were two very different mediums that did exactly what I’d hoped for .. RustOleum Clear Sealer which is water-based and OsmoColor Dekorwachs which has a wax/oil base (this is the German version from more than 20 years back when I was living there. Names and packaging may have changed but Osmo products have remained essentially the same). I painted the RustOleum wood sealer as thinly as possible and undiluted on sample wood swatches. There was a little curving but within a couple of hours these were perfectly flat again. Also, after drying I couldn’t even tell which pieces of sample veneer I’d painted! I knew there wouldn’t be a warping issue with the Osmo wax/oil, but I’d expected significant darkening. The next day after proper drying the change in tone of the wood was only very slight! Because wax/oil penetrates into the wood more than water-based sealer and different woods will react to this in different ways, there could be more darkening with some of them. A solution to this is to add a very little amount of white, preferably using the ‘transparent white’ version of the same medium if there happens to be one. I was never a fan of using the ‘older style’ .. i.e. spirit or oil-based .. gloss paints in models because there were always problems! 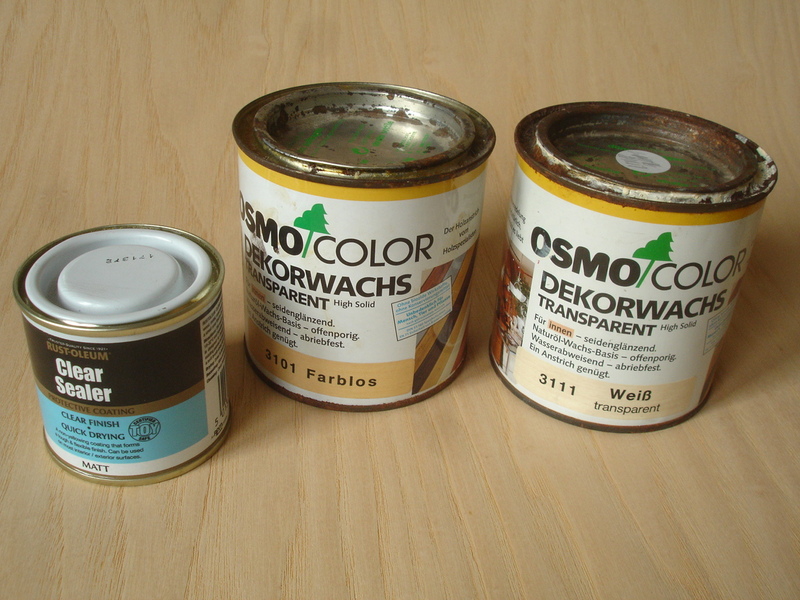 Here’s the shortlist: – unless the surface to be painted is immaculate, every imperfection becomes very noticeable; unless this surface is evenly primed or suitable for the paint the ‘gloss’ that results after drying can turn out patchy; gloss paints used to be notoriously unstable, needing religiously thorough mixing beforehand and sometimes failing to dry properly even then; during a lengthy drying process the surface is bound to catch some dust particles whatever the precautions. On a more important level than all that hassle, there was my emerging notion that ‘gloss’ just doesn’t translate in scale anyway! That something a bit more subtle and light-friendly .. like ‘satin’ .. conveys ‘glossiness’ better in the smaller scale? However, part of my brief was to use the gloss paints that would eventually be used on the real items .. a good idea, yes, but only in terms of colour matching as it turned out. The new breed of acrylic water-based gloss paints may be progressive in some important ways .. but they’re certainly not for painting models! They .. at least, the ones I was given .. are thick, not opaque enough, non-levelling and they congeal so fast when brushed on that it’s difficult to even out the paint layer .. even on small areas! In spite of firming up far too quickly, they also seem to take a long time to ‘dry’ fully! I found this out when I took a handful of painted swatches to a meeting .. they had stuck together, a full week after painting them! I managed to make the surfaces look reasonably clean and streak-free in the end .. but it took a lot of effort. 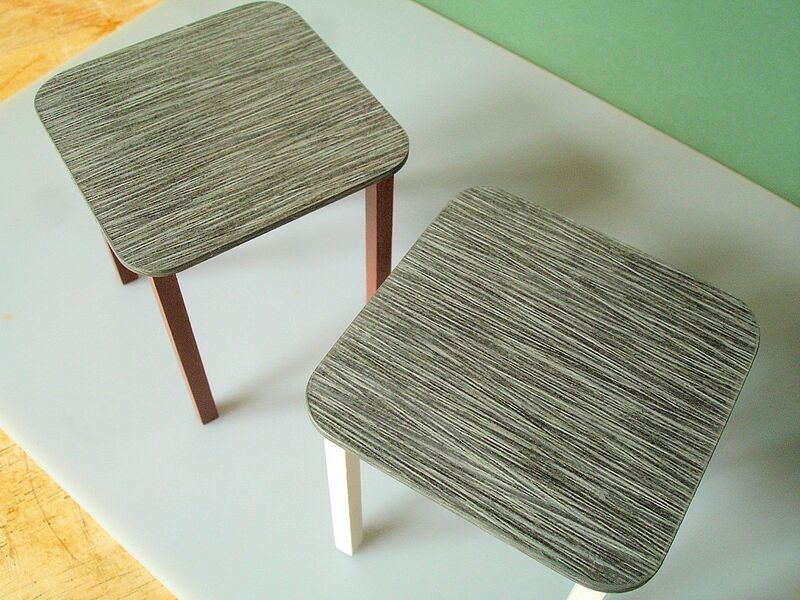 I made each item of painted furniture in Palfoam Pvc which I ‘grained’ very slightly by drawing P120 sandpaper in straight lines across (to suggest painted wood). I had to prime the Pvc first and because the gloss paints had too much transparency I used Humbrol enamels as an undercoat, mixing as near as I could get to the final colour. The adhesion between Pvc/enamel and enamel/acrylic was first-rate! 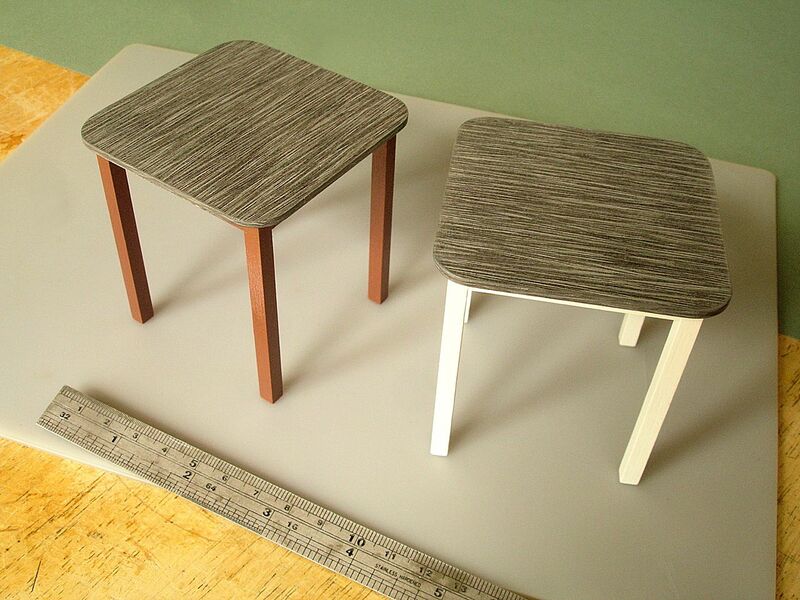 I had to make two versions of the ‘Peggy’ chair, as it was called .. one plain ash and the other gloss grey. 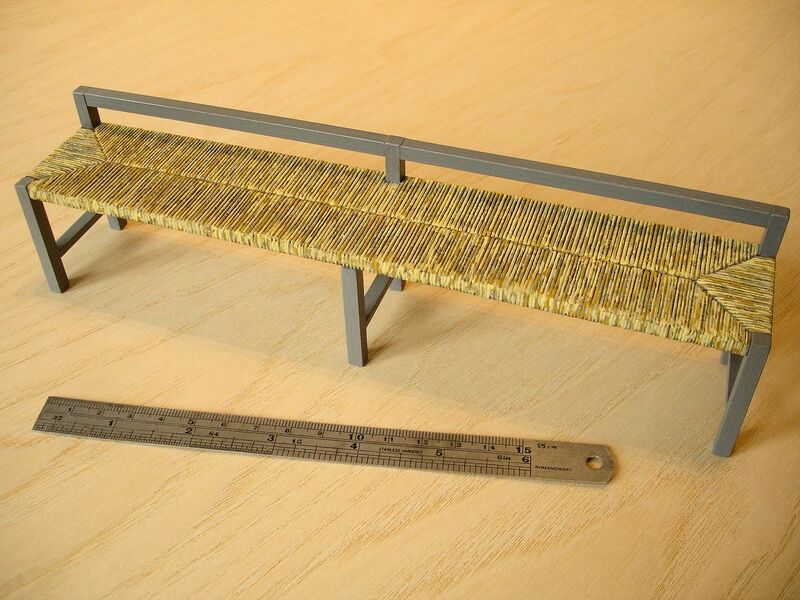 As with the settles the legs are dowel but needed to be 4mm diameter and this doesn’t normally exist! Luckily there was just one online source that did have this size but in ramin wood. 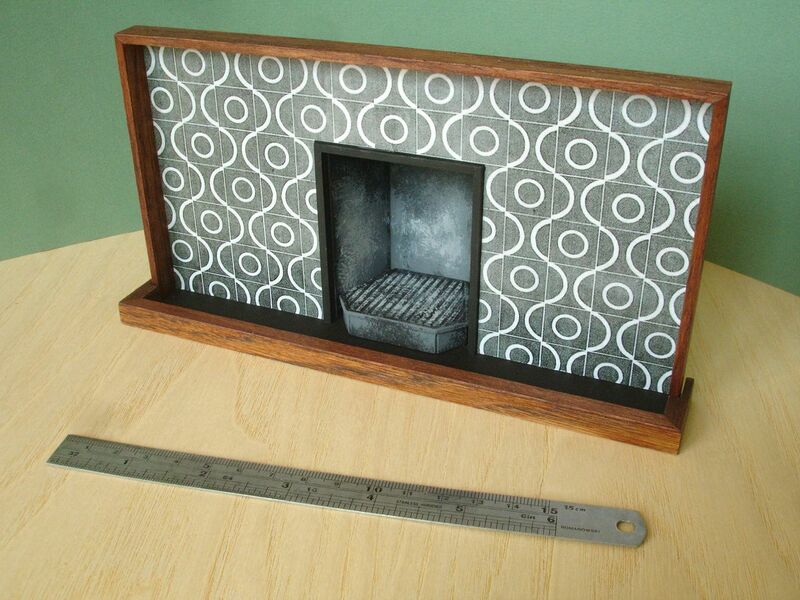 Lastly I wanted to include here a picture of the ‘Peggy Arnold’ fireplace on its own. I was fond of the way this looked! I used an original Peggy Arnold pattern, printed on gloss photo paper in grey tones, for the tiling. 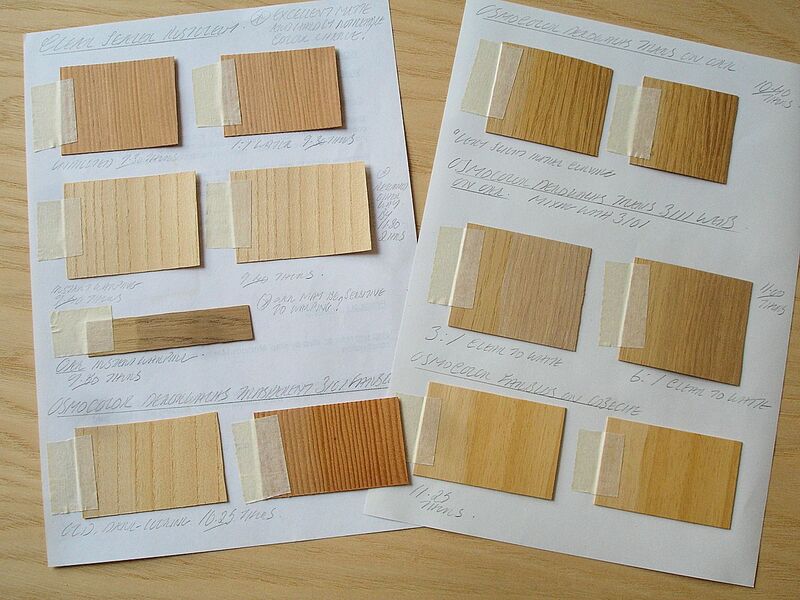 The last promising discovery was that Marabu GlasArt glass paints make excellent wood varnishes! Here I have used the ‘Brown’ as it came (they can be thinned with white spirit). One coat brushed then evened out with a tissue will create a good matte cover, but after this first coat has dried for a day a second will give a nice, even silk/gloss. This entry was posted in architectural models, construction, design, foamed Pvc, materials, model-making, painting, surfaces and tagged 'Common Parts' furniture collection, 1:10 scale furniture models, best sealants or protection for wooden models, choice of best 'scale' for model surfaces, disadvantages of water-based gloss paints, gluing wood veneer to plastic, good sources for wood veneer, image transfer, making model furniture in Palight or Palfoam, model furniture, models of designer furniture, priming plastic with Humbrol enamel, printing on acetate to simulate polished wood or marble, pros and cons of using gloss paints for models, simulating marble in a model, simulating rushwork in a model, The New Craftsmen furniture, transferring inkjet image to plastic, using Marabu GlasArt glass paint as wood varnish, using Osmo paints and finishes, working with wood veneer by david neat. Bookmark the permalink. A really interesting article, David. Thanks for all the detail regarding process and finishes. Looks great. Incredibly precise work. I often recommend your book to students. Excellent and detailed article. Your models look indeed very real and I found the entire process fascinating. 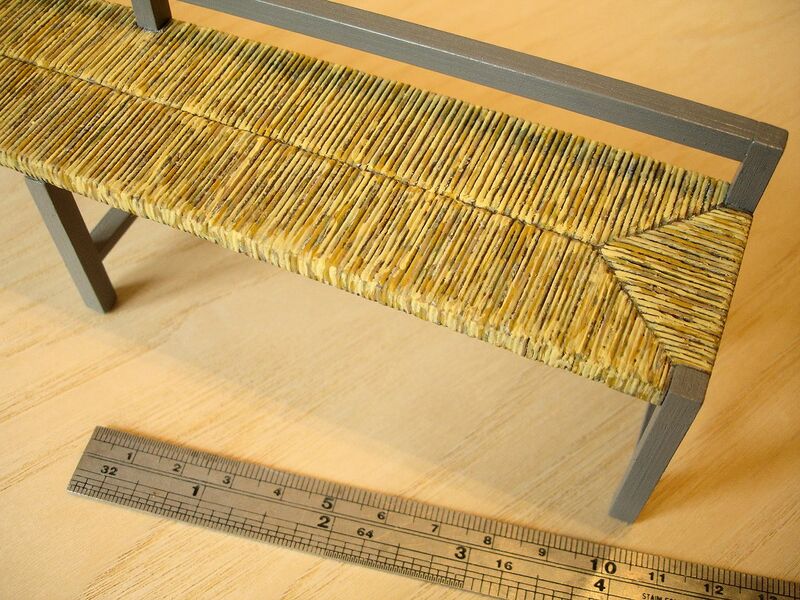 Thank you for sharing, another interesting artical, as an retired cabinet maker and now 1/35 scale model maker I thought your results very true to life.